Want to be notified of new releases in dtolnay/proc-macro-workshop? This repo contains a selection of projects designed to learn to write Rust procedural macros -- Rust code that generates Rust code. Each of these projects is drawn closely from a compelling real use case. Out of the 5 projects here, 3 are macros that I have personally implemented in industrial codebases for work, and the other 2 exist as libraries on crates.io by other authors. This workshop covers attribute macros, derive macros, and function-like procedural macros. Be aware that the content of the workshop and the explanations in this repo will assume a working understanding of structs, enums, traits, trait impls, generic parameters, and trait bounds. You are welcome to dive into the workshop with any level of experience with Rust, but you may find that these basics are far easier to learn for the first time outside of the context of macros. Here is an introduction to each of the projects. At the bottom, I give recommendations for what order to tackle them based on your interests. Note that each of these projects goes into more depth than what is described in the introduction here. This macro generates the boilerplate code involved in implementing the builder pattern in Rust. Builders are a mechanism for instantiating structs, especially structs with many fields, and especially if many of those fields are optional or the set of fields may need to grow backward compatibly over time. There are a few different possibilities for expressing builders in Rust. Unless you have a strong pre-existing preference, to keep things simple for this project I would recommend following the example of the standard library's std::process::Command builder in which the setter methods each receive and return &mut self to allow chained method calls. Callers will invoke the macro as follows. processing helper attributes to customize the generated code. Project skeleton is located under the builder directory. This macro implements a derive for the standard library std::fmt::Debug trait that is more customizable than the similar Debug derive macro exposed by the standard library. In particular, we'd like to be able to select the formatting used for individual struct fields by providing a format string in the style expected by Rust string formatting macros like format! and println!. limitations of derive's ability to emit universally correct trait bounds. Project skeleton is located under the debug directory. This macro provides a syntax for stamping out sequentially indexed copies of an arbitrary chunk of code. For example our application may require an enum with sequentially numbered variants like Cpu0 Cpu1 Cpu2 ... Cpu511. But note that the same seq! macro should work for any sort of compile-time loop; there is nothing specific to emitting enum variants. A different caller might use it for generating an expression like tuple.0 + tuple.1 + ... + tuple.511. Project skeleton is located under the seq directory. A macro for when your coworkers (or you yourself) cannot seem to keep enum variants in sorted order when adding variants or refactoring. The macro will detect unsorted variants at compile time and emit an error pointing out which variants are out of order. limitations of the currently stable macro API and some ways to work around them. Project skeleton is located under the sorted directory. This macro provides a mechanism for defining structs in a packed binary representation with access to ranges of bits, similar to the language-level support for bit fields in C.
The macro will conceptualize one of these structs as a sequence of bits 0..N. The bits are grouped into fields in the order specified by a struct written by the caller. The #[bitfield] attribute rewrites the caller's struct into a private byte array representation with public getter and setter methods for each field. The total number of bits N is required to be a multiple of 8 (this will be checked at compile time). For example, the following invocation builds a struct with a total size of 32 bits or 4 bytes. It places field a in the least significant bit of the first byte, field b in the next three least significant bits, field c in the remaining four most significant bits of the first byte, and field d spanning the next three bytes. The code emitted by the #[bitfield] macro for this struct would be as follows. Note that the field getters and setters use whichever of u8, u16, u32, u64 is the smallest while being at least as large as the number of bits in the field. // Initializes all fields to 0. Project skeleton is located under the bitfield directory. If this is your first time working with procedural macros, I would recommend starting with the derive(Builder) project. This will get you comfortable with traversing syntax trees and constructing output source code. These are the two fundamental components of a procedural macro. After that, it would be equally reasonable to jump to any of derive(CustomDebug), seq!, or #[sorted]. Go for derive(CustomDebug) if you are interested in exploring how macros manipulate trait bounds, which is one of the most complicated aspects of code generation in Rust involving generic code like Serde. This project provides an approachable introduction to trait bounds and digs into many of the challenging aspects. Go for seq! if you are interested in parsing a custom input syntax yourself. The other projects will all mostly rely on parsers that have already been written and distributed as a library, since their input is ordinary Rust syntax. Go for #[sorted] if you are interested in generating diagnostics (custom errors) via a macro. Part of this project also covers a different way of processing input syntax trees; the other projects will do most things through if let. The visitor approach is better suited to certain types of macros involving statements or expressions as we'll see here when checking that match arms are sorted. I would recommend starting on #[bitfield] only after you feel you have a strong grasp on at least two of the other projects. Note that completing the full intended design will involve writing at least one of all three types of procedural macros and substantially more code than the other projects. Testing macros thoroughly tends to be tricky. 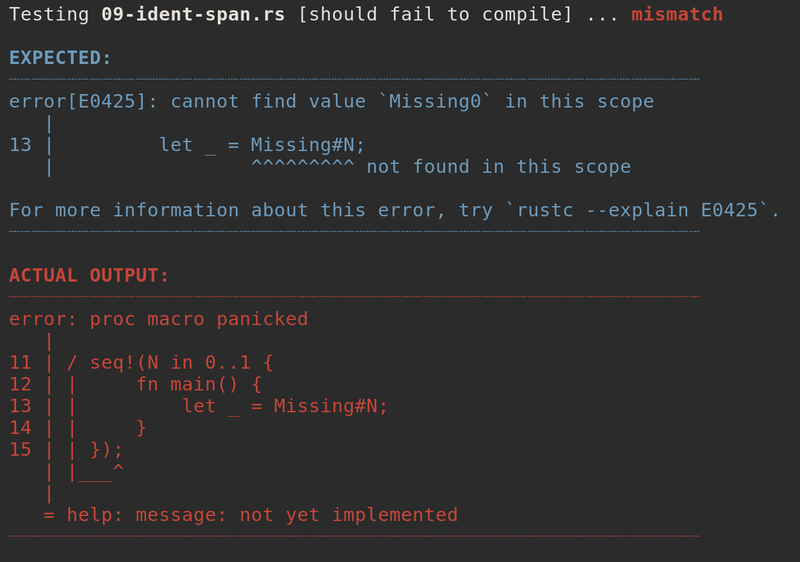 Rust and Cargo have a built-in testing framework via cargo test which can work for testing the success cases, but we also really care that our macros produce good error message when they detect a problem at compile time; Cargo isn't able to say that failing to compile is considered a success, and isn't able to compare that the error message produced by the compiler is exactly what we expect. The project skeletons in this repository use a custom test harness written specifically for my procedural macros workshop at the 2019 Rust Latam conference, though potentially useful elsewhere with a bit of work. The test harness is geared toward iterating on the implementation of a procedural macro, observing the errors emitted by failed executions of the macro, and testing that those errors are as expected. The source of the test harness can be found under the test-runner directory. Run cargo test inside any of the 5 top-level project directories to run the test suite for that project. Initially every projects starts with all of its tests disabled. Open up the project's tests/progress.rs file and enable tests one at a time as you work through the implementation. 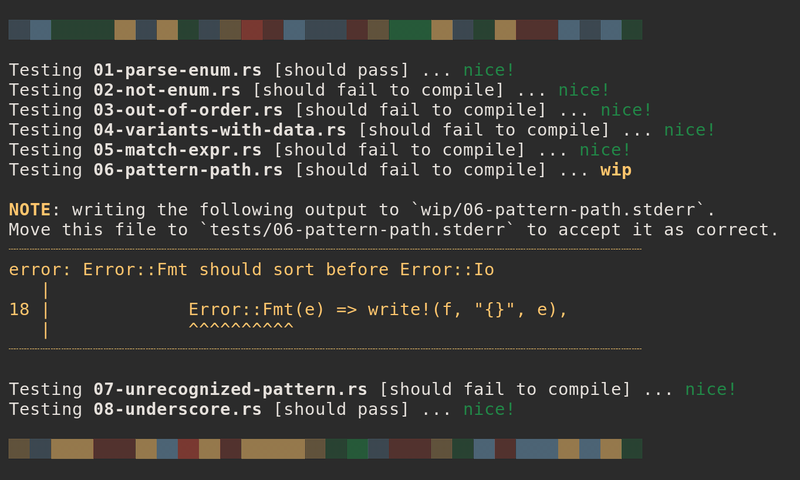 The test files (for example tests/01-parse.rs) each contain a comment explaining what functionality is tested and giving some tips for how to implement it. I recommend working through tests in numbered order, each time enabling one more test and getting it passing before moving on. Tests come in two flavors: tests that should compile+run successfully, and tests that should fail to compile with a specific error message. If a test should compile and run successfully, but fails, the test runner will surface the compiler error or runtime error output. For tests that should fail to compile, we compare the compilation output against a file of expected errors for that test. If those errors match, the test is considered to pass. If they do not match, the test runner will surface the expected and actual output. Expected output goes in a file with the same name as the test except with an extension of *.stderr instead of *.rs. If there is no *.stderr file for a test that is supposed to fail to compile, the test runner will save the compiler's output into a directory called wip adjacent to the tests directory. So the way to update the "expected" output is to delete the existing *.stderr file, run the tests again so that the output is written to wip, and then move the new output from wip to tests. To look at what code a macro is expanding into, install the cargo expand Cargo subcommand and then run cargo expand in the repository root (outside of any of the project directories) to expand the main.rs file in that directory. You can copy any of the test cases into this main.rs and tweak it as you iterate on the macro. If a macro is emitting syntactically invalid code (not just code that fails type-checking) then cargo expand will not be able to show it. Instead have the macro print its generated TokenStream to stderr before returning the tokens. Then a cargo check in the repository root (if you are iterating using main.rs) or cargo test in the corresponding project directory will display this output during macro expansion. Stderr is also a helpful way to see the structure of the syntax tree that gets parsed from the input of the macro. Note that in order for Syn's syntax tree types to provide Debug impls, you will need to set features = ["extra-traits"] on the dependency on Syn. This is because adding hundreds of Debug impls adds an appreciable amount of compile time to Syn, and we really only need this enabled while doing development on a macro rather than when the finished macro is published to users. Unless you explicitly state otherwise, any contribution intentionally submitted for inclusion in this codebase by you, as defined in the Apache-2.0 license, shall be dual licensed as above, without any additional terms or conditions.